Houghton Mifflin Harcourt, 9780547152431, 304pp. While working at the "Wall Street Journal," Sarah Ellison won praise for covering the $5 billion acquisition that transformed the pride of Dow Jones and the estimable but eccentric Bancroft family into the jewel of Rupert Murdoch's kingdom. Here she expands that story, using her knowledge of the paper and its people to go deep inside the landmark transaction, as no outsider has or can, and also far beyond it, into the rocky transition when Murdoch's crew tussled with old "Journal" hands and geared up for battle with the "New York Times." With access to all the players, Ellison moves from newsrooms to estates and shows Murdoch, finally, for who he is--maneuvering, firing, undoing all that the Bancrofts had protected. Her superlative account transforms news of the deal into a timeless chronicle of American life and power. "[Ellison] spins an absorbing yarn played out on super-yachts and in corporate jets, populated by an irresistible cast of characters." "A book as devastatingly definitive as any Journal tick tock." "Ellison, who covered the takeover of Dow Jones as a Wall Street Journal reporter, uses her access to ‘all of the significant players in the narrative’…to chronicle the deal with precision. Inside the news business such detailed narratives are called 'tick-tocks,' and hers beats like a metronome." "The story behind his takeover of the newspaper is recounted in limber fashion in War at the Wall Street Journal, by ex-Journal reporter Sarah Ellison. . . . Based on her original reporting for the newspaper (and re-reported here), the book is . . . scrupulously documented." "Ellison transforms the daily copy she filed as media reporter for the paper into a nail-biting thriller that delves into the family dysfunction, backroom dealings and ego bruising that characterized the decade’s most fascinating business transaction. There’s a panoply of new material here, from the incessant infighting that rendered Dow Jones’ owners, the Bancroft family, impotent in their final dealings with Murdoch, to the mind-boggling details of the multimillion-dollar severance package paid to Marcus Brauchli, the ousted Journal editor"
"The Dow Jones saga is a fascinating story and you did a terrific job of telling it." 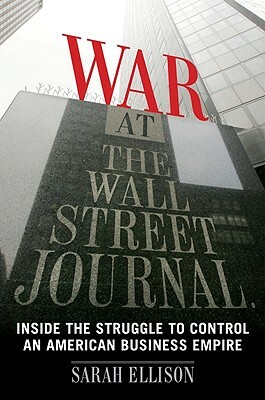 "Former Journal reporter Sarah Ellison's War at the Wall Street Journal - a detailed and fast-moving account of Murdoch's 2007 deal to acquire Journal-parent company Dow Jones - couldn't have come at a better time, just as Murdoch begins his battle with the Times....Ellison's book provides not just a deeply investigated back-story of the deal, but also an insider's perspective."